As the studio unveils its plans for its 100th anniversary, Variety reports that Universal is planning on a sequel to the 2003 hit comedy "Bruce Almighty". 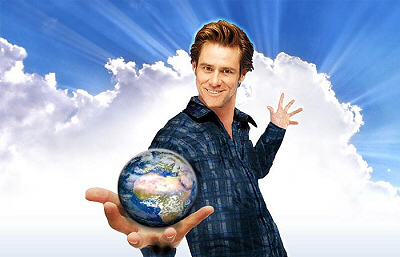 In the film, Jim Carrey played a reporter named Bruce Nolan, who's fed up with the way his life goes and curses God. But then the big guy himself (played by Oscar winner Morgan Freeman) shows him how his life would be better when He gave Bruce His powers. The film marked Carrey's biggest worldwide hit to date grossing about $500 million! It spawned a less-than-stellar 2007 sequel/spin-off titled "Evan Almighty" with Steve Carell reprising his role as Evan Baxter in a story inspired by Noah's Ark. It only grossed $175 million worldwide. Both films were directed by Tom Shadyac, director of Carrey's earlier hits "Ace Ventura: Pet Detective" and "Liar Liar". The studio is currently in talks with screenwriters Jarrad Paul and Andrew Mogel, who scripted the hit comedies "Hot Tub Time Machine" and Carrey's "Yes Man". No word yet if Carrey nor Shadyac will return as Carrey is currently filming "Burt Wonderstone" in Las Vegas opposite Carell. However, he has been in talks to reunite with the Farrelly brothers and Jeff Daniels for New Line's proposed "Dumb & Dumber" sequel. -- Source: Variety. With thanks to chips and dip. Click to comment this article.